Karen Creates Cards: Merry Monday #207 It's in the Bag! 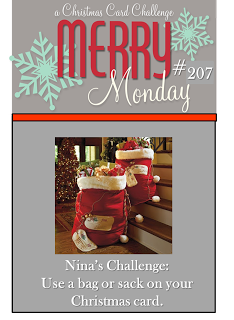 Merry Monday #207 It's in the Bag! This is a second card for me today. I am also joining in with Merry Monday's Christmas Card challenge. I missed last week as I didn't have a nativity scene. I also didn't have a stamp or image with a Bag or Sack so I had to make one in Serif. I think it squeaks in??!! 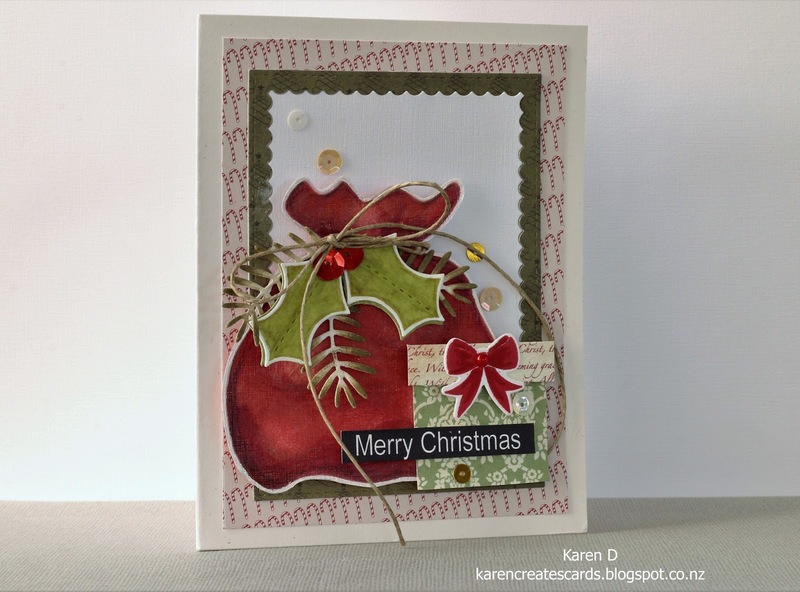 Foliage is from the MFT Leaf Greenery Die Set and Ivy from a Lil' Inker Christmas Die Set. The bow is from W Plus 9's 'Woodland Wreath' set. I have drawn the Santa sack in Serif, printed and cut it out then coloured it with Watercolour pencils. I added just a touch of water to slightly blend the colours. It's very cold here in NZ, but very hot in the U.S. Whatever your weather, happy stamping. Darling bag card - just love the holly details!! I think it works for the challenge! :) Love your coloring--nice shading especially. Great collage of elements, too. Tfs! Very clever and creative Karen, I love your sack, perfect for the challenge. Thanks for sharing at Merry Monday. This is gorgeous, Karen! 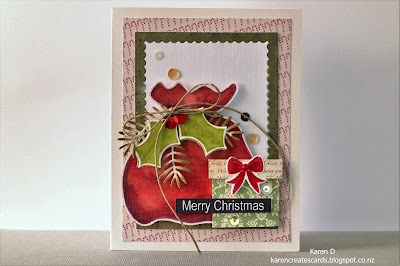 Your Santa sack looks fabulous! Fabulous card Karen, I love the all those details and layers. Thank you for joining us for Merry Monday. This is the most amazing Santa bag, Karren! I'm impressed with your creativity in making it and decorating it so beautifully! Thanks for sharing with us at Merry Monday! A great idea making the sack the focal point! Very pretty with the colors and layers! Congrats on the win at Merry Monday with this beauty! !